DRINKING good wine in Thailand can be problematic for visitors, with many good wines ultra-expensive due to local taxation laws and with poor storage also sometimes an issue. Not so at The Nai Harn, the first luxury resort on Phuket which reopened in 2016 after extensive renovations and is the only Leading Hotels of the World member on Phuket. Overlooking pristine Nai Harn Beach, the Nai Harn makes a virtue of its wine lists (including a selection of rosés from around the world selected by wine guru James Suckling) and its regular hostings of culinary kingpins ranging from mixologist Salim Khuory to chef Will Holland. Rock Salt, The Nai Harn’s chic beachside restaurant serves up inventive dishes featuring flavours from the Eastern Mediterranean and North Africa, while recently opened sushi and sashimi bar, Hansha, offers spectacular rooftop views, and Cosmo serves a wide range of cuisines, including an outstanding buffet breakfast. The culinary team has also created a choice of special private dining menus catering to couples seeking an intimate meal for two served on the spacious private terraces that connect to each of Nai Harn’s 130 rooms and suites, most of which also feature four-poster daybeds. “The Nai Harn concept goes well beyond offering luxurious accommodation,” says general manager Frank Grassmann. “Our aim is to ensure that each step of every guest’s journey with us is an experience to be remembered. Perhaps nowhere is this more apparent than in our ever-changing culinary offerings and emphasis on world class cuisine. 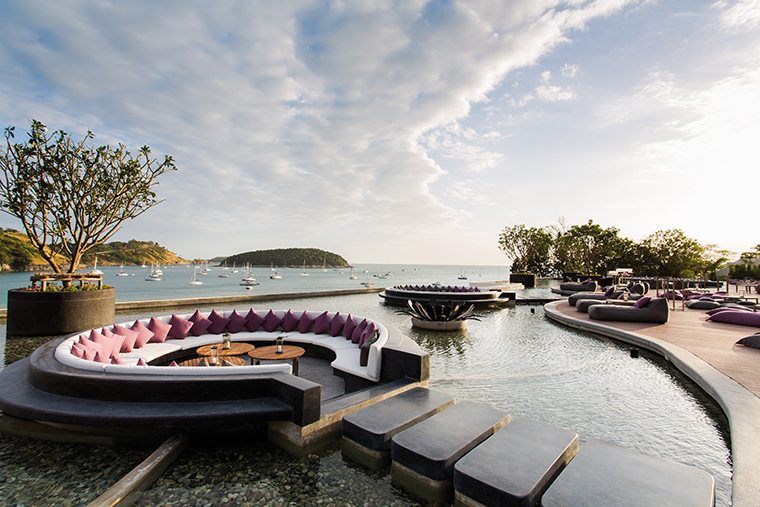 Since the resort re-opening last May, the Nai Harn has quickly become one of Phuket’s most sought-after dining destinations. To wash down the fine fare, the Nai Harn wine cellar stocks an impressive range of fine vintage wines, including personal selections made by Suckling, who hosted a Great Wines of Italy gala event at the resort. Grassmann introduced a consumer friendly wine pricing policy with attractive prices on a full range of wines. “Great food deserves fabulous wine. So we decided to add amazing prices and complete the overall pleasure of the experience,” he said. Visit www.thenaiharn.com.